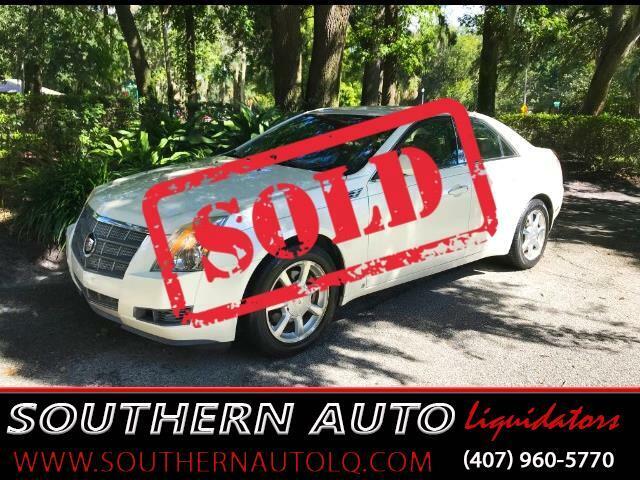 You are looking at a beautiful Pearl White 2008 Cadillac CTS. The 2008 Cadillac CTS is a responsive sports sedan with excellent handling and high-speed stability, yet it's smooth and quiet when cruising. The cabin is marvelous, the driving dynamics are first-rate and the amenities are useful for real drivers, not just technophiles. Credit a lot of the power to the six-speed automatic. It's remarkably adaptive, moving smoothly through gears at lower speeds and snapping off lightning-quick shifts under hard acceleration. And there's no shortage of acceleration, with this engine. Confident styling, an upscale cabin, and innovative features should win the Cadillac CTS plenty of buyers. Every CTS comes with a basic package of 32 luxury, comfort, convenience and safety items including all the normal power assists, XM satellite radio, and a Bose eight-speaker sound system with CD, MP3, and auxiliary capability and steering wheel controls. Heated/Cooled front seats. Ice cold A/C with dual climate control. Cruise Control, and more. This car exudes Luxury from top to bottom and is a really comfortable, fast and smooth ride. Come check it out for yourself! Call to schedule a test drive today!